because I live in this area and can occasionally go down and check out sites for myself. Houdini was in town in January 1906 and had a very successful run. It looks as though demand for Houdini was pretty high because he was back in September for two weeks. This time performing at Chase's Polite Vaudeville Theatre. 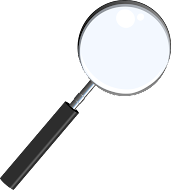 Search as I have, I've been unable to turn up a photo of Chase's theatre. However, to the right is a program from Chases. The building has long been torn down. However, it was a very popular location during Houdini's time and he was in town doing his Straitjacket, Handcuff and challenge escapes. Houdini began his run on Sunday September 16, 1906 featuring a standard stuff from his repitiore, but let's face it, his standard material was quite exciting. In one escape demonstration he was handcuffed with a half dozen pair of wrist and leg irons. During another sequence he was tied to a chair with several yards of rope by members of the audience. The final demonstration was his first challenge of the week. This is what the Evening Star Newspaper reported, "Possibly the most pleasing of his demonstrations was the simple manner in which he opened a pair of antique handcuffs from Greece, furnished by Andrew Alexaids, a local Greek interpreter, and an old-time pair of slave handcuffs. He freed himself from these manacles in full view of the audience, the slave-era handcuffs yielding when simply tapped on the floor." September 17, 1906 the newspaper ad for Chase's says "Houdini-The World's Handcuff King and Prison Breaker, IN NEW AND SENSATIONAL ESCAPE FEATS AT EVERY PERFORMANCE. Police and Public Challenged to Test His Never Defeated Power." Also at the bottom of the ad it says that Houdini has been re-engaged for next week, so he'll be staying over an extra week. September 18, 1906 the newspaper ad reads "Houdini Challenged! TONIGHT HE WILL ATTEMPT TO ESCAPE FROM A MURDEROUS MANIAC'S STRAIT-JACKET ...... CAN HE DO IT? September 19, 1906 the newspaper ad reads "Houdini's Greatest. Tonight he will attempt the most difficult handcuffs ever used to challenge him. Will he free himself??? September 20, 1906 the newspaper ad reads "HOUDINI IN A BAG! Challenged by Killian & Co., paper box manufacturers, Houdini will tonight try to escape from a big paper bag. Can he?" So far the week has been fairly normal material for Houdini. The Paper Bag Escape is something he would repeat in other cities. September 21, 1906 the newspaper ad reads "HOUDINI BOXED UP Tonight he will attempt to escape from a packing case made by the packers of S. Kann, Sons & Co., Will he succeed?" September 22, 1906 Houdini offers a twist on an earlier escape. Here is what the newspaper ad read, "HOUDINI IN A BAG No.2 Tonight he will try to get out of a paper bag tied at both ends. Will he do it? Come and See!" September 23, 1906 marks the beginning of the second week. An interesting thing takes place. Because Houdini has been drawing so many people to his shows, the theatre has decided to open up the wings on the stage and ad chairs there! These seats come at a premium. In addition the newspaper ad for Sunday Sept 23, changes it's look at lists all of the weeks challenges. 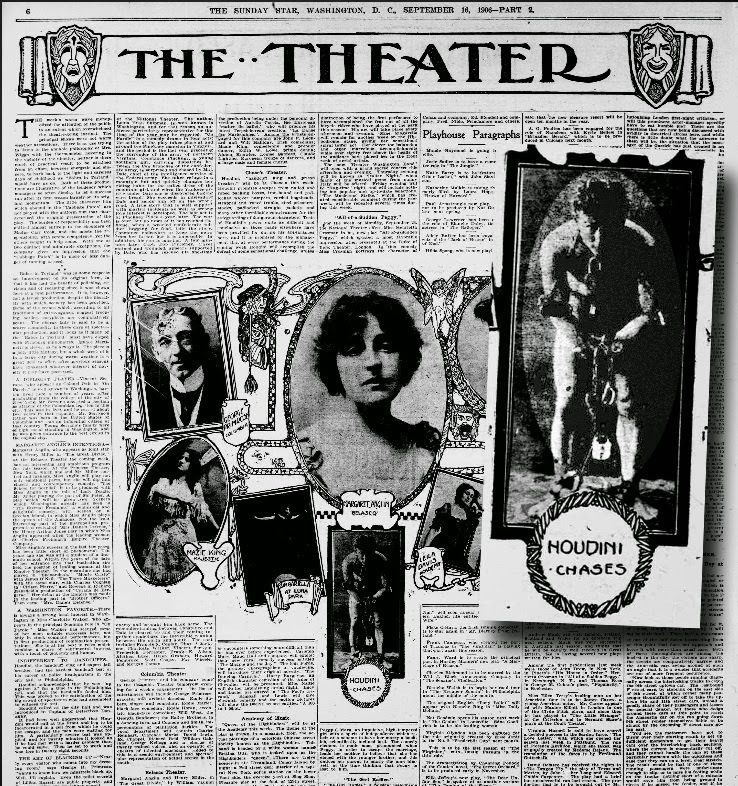 There are articles in two different papers featuring Houdini in addition to the newspaper ads. One of the articles mentions that there will be a challenge escape at every performance in addition to Houdini's usual program of handcuff releases. September 24, 1906 the newspaper ad reads, "HOUDINI's ORDEAL. Tonight he will attempt to escape from a maniac murderer's strait-jacket in full view of the audience. A thrilling event. Can he get out?" The following day another paper ads this report about the Sept 24 performance, "Last night he submitted to the demands of an insistent challenger who presented a manacle different from the regulation pattern required in the act. It took some minutes longer than the usual for Houdini's performance, but when he emerged from his cabinet, both hands were free." September 25, 1906 the newspaper ad reads, "HOUDINI IN A CASE. Tonight he will attempt to escape from the Saks & Co., packing case, which will be constructed on the stage in full view of the audience." September 26, 1906 the newspaper ad reads, "HOUDINI JACKETED Tonight he will attempt to escape from a Blackwell's Island insane asylum homicidal lunatic's strait-jacket, with leg bag and ropes upon him." On September 27th there is an unusual change in the ads that appear in the Washington Time and The Evening Star papers. One of them prints an ad that reads, "HOUDINI IN ROPES Tonight he will make a sensational effort to escape from rope imprisonment in a chair." But the other paper has an ad that lists a whole bunch of challenges. 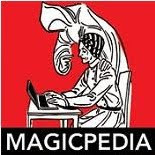 That ad reads, "HOUDINI, The Mysteriarch of Manacles and Prisons. TWELVE CHALLENGE ESCAPE ATTEMPTS. Every Matinee and Every Evening Night. Houdini will make different Thrilling Tests of His Powers. Lunatic's Crib Escape. The Door Transfixion. The Ladder-of-death Suspension. The Witches' Pillory Confinement. The Invincible Paper Bag Release. The Iron Crate Incarceration. The Mammoth Football. The Greater Packing Case Tests. The Padlocked Leather Bag Escape. The Thrilling Hindoo Needle Feats, &c. &c. &c." There is one more article from the 27th, but I'm saving it for the end. Tonight he will attempt to escape from the Knabe & Co. Piano Export Packing Case, Lined with Zinc and Screw-Fastened, etc." September 29th, 1906 was his final night of the two week run. 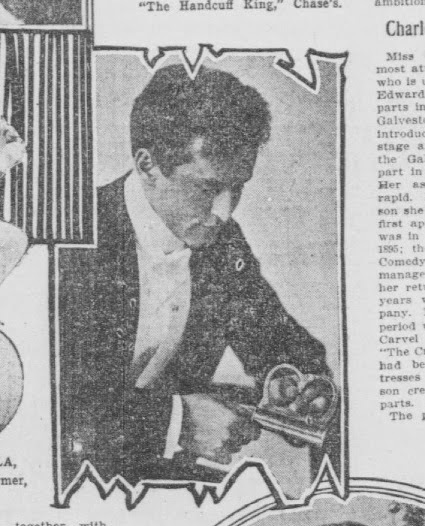 Here is what the ad says, "HOUDINI'S FAREWELL Tonight he will conclude his engagement with a grand display of his power of manacles and strait-jackets." That concludes his two week run at Chase's Polite Vaudeville Theatre. However, I wanted to reprint the newspaper article that appeared on Sept 27th, 1906. It's a little too long to just retype, so I am putting it below so you can read the entire thing yourself. Great post, Dean! As Patrick Culliton wrote in The Key, one of Houdini's attributes was The Power.